Swiss Government Excellence Ph.D. Scholarship is for highly qualified post-graduate students from all academic fields, who want to pursue Ph.D. from Switzerland. The scholarship allows the selected candidates to spend 3 years in Switzerland doing their Ph.D. from any of the 10 Swiss Public Universities, Federal Institutes of Technology and Teaching & Research Institutes (List provided toward the end). The candidates selected for Swiss Government Excellence Ph.D. Scholarship will be exempted from Tuition Fee of the Institutions and will also get a monthly allowance, Air Fare, and other benefits. The duration of the scholarship is 3 years and candidates can undertake full-time Ph.D. studies in Switzerland. There is no application fee to apply for the Scholarship and the Application Forms can be obtained from Swiss Embassy in New Delhi. Nationality: The Swiss Government Excellence Ph.D. Scholarship is available for Indian citizens. Age: The candidate should be younger than 35 to make application for the scholarship. Academic Qualification: The candidate making application should have a Master’s or Equivalent University Degree recognized by Swiss Universities. Language: The candidate should possess the necessary language skills required as per their research and selected University/Institution. Students who are in Switzerland for more than one year are not eligible for the Scholarship. 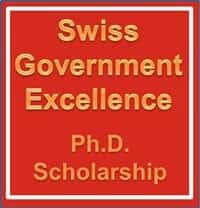 Applicants who have already been awarded with Swiss Government Excellence Ph.D. Scholarship are not eligible for making application second time. Monthly Allowance: A monthly allowance of 1920 Swiss Francs (Approx. INR 1,30,000) will be offered to the students selected for the Scholarship. Tuition Fee: No tuition fee will be charged from the selected candidates for their studies. Medical Insurance: Federal Commission for Scholarships will bear the cost of Swiss Health Insurance. Air Fare: Paymentof a lump sum amount will be done at the end of the scholarship to cover up the air fare expenses. Housing Allowance: At the beginning of the academic program a housing allowance of 300 Swiss Franc (Approx. 20,000 INR) will be given to the candidates. Transport Card: The candidates will get 1 year half-fare public transportation card. Other benefits: The selected students will become a part of Counseling, trips, dinners and sigh-seeing tours organized for Swiss Government Excellence Scholarship holders. Application Form: The application form can be obtained by sending an email to Swiss Embassy, New Delhi. Copies of Passport and Photographs: Each set of application should have 2 copies of the main page of passport and photograph. Curriculum Vitae: The applicant should provide 2 CVs, one detailed and other short for the Academic Supervisor. Academic Documents: Attested copies of Grade Sheets & University Certificates in English/German/French or Italian should be attached with the application form. University Authorities or Government Officer can attest the documents. Research Proposal: A research proposal Applicants should submit a research proposal of maximum 5 pages using the official research proposal form provided with the application package. Recommendation Letters: 2 letters of recommendation from the professors from the same field as of applicants. The letters should be on the official reference form provided with the application package. Letter of Motivation: The applicant should submit a letter of motivation having maximum 2 pages. Confirmation letter from Swiss Professor: Candidates should obtain and send a copy of confirmation from the Professor at the intended Swiss Institution that they are willing to supervise the proposed research. Health Certificate: Health Certificate issued by a competent authority on the official health certificate provided with the application package. All original, signed documents and attested translations will be in SET 1 and the other 2 sets will be the photocopy of SET 1. The topic of the research project selected by the candidate, its originality, and methodological soundness will also be considered. The Academic Profile of the candidate and his research capacities will be the prime selection criteria. The quality of supervision and the potential for future academic cooperation will also form the basis of selection.